Mount St. Alphonsus is also known as the Redemtorist. Having operated out of a temporary church structure since 1854 the foundation stone for the new church was laid by Bishop Ryan on the 22nd May, 1858. His successor, Bishop Butler, dedicated the completed church in December, 1862. The cost was £17,000. The Limerick chapter of the Archconfraternity of the Holy Family, sprang from the Limerick Young Men’s Society upon its demise in 1867. 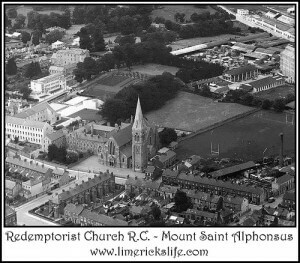 The Redemptorist Fathers had established themselves in the community, fourteen years previously, in the Church of Mount St. Alphonsus. This new Confraternity of the Holy Family, with its patroness Mary, Mother of Perpetual Succour began in January 1868.Following the example of the Holy Family at Liege in Belgium, a Mission was held to the men of the city. During this Mission, great numbers of men who had been absent from their duties for years and years received the Sacraments of Confirmation, Confession and Holy Communion’. The motive for the commencement of the Society was to raise the religious tone of the men of Limerick, and unite them in one firm association for their spiritual good.